Every organization needs to constantly weigh growth versus risk, trying to find the ideal balance to make everyone happy. Granted, in a dynamic environment such as commercial real estate, there’s rarely, if ever, a single solution that can satisfy every expectation and demand. However, particularly in the high reward arena of digital technologies, an effective cyber risk management strategy can go a long way in maintaining a grin on everyone's faces. In fact, a far-reaching and deliberate cyber risk management strategy allows a CRE firm to push the traditionally stodgy and confining boundaries of the industry while protecting all stakeholders from unnecessary risk. And just in case you're thinking to yourself right about now, "Yeah, Embark, that sounds great, but I'd also like a château in France – and both are downright herculean tasks," we have one thing to say to you – au contraire, mon frère. So on that note, join us, your purveyors of all things relating to digital transformation – and minimal French skills – as we take a deeper dive into what a finely tuned and powerful cyber risk management strategy should target, helping you find that ideal balance. Sure, weighing growth versus risk will always be a bit of a high wire act, but with Embark leading the way, your firm and stakeholders don't have to feel like you're a thousand feet above solid footing. Risk might be a four letter word, but shouldn't be confused with its saltier brethren that make your elderly neighbor blush. In the CRE sector, there's interest rate risk, financing risk, and even portfolio risk from a top level perspective, not to mention more industry agnostic risks such as more traditional enterprise risk, operational risk, business risks, etc. None of these sources of risk are inherently bad, however, but just a facet of operations that firms must sufficiently lasso to limit excessive risk exposure. Risk spurs growth and success, but even the best things in life must be kept in check. Firms can and should apply that very same perspective to cyber risk management, where the intelligent adoption of critical technologies creates a foundation built upon innovation and efficiency but, once again, must be throttled to limit excessive risk. But how does a CRE firm accomplish such a heady task? In short, by being vigilant and visionary, the sort of organization that is proactive rather than reactionary. Like any other effective strategy, a successful approach to cyber risk management begins by identifying specific goals and then developing pathways to reach those goals. While every enterprise is different and has its own unique set of desired outcomes, resources, and core competencies, we thought it best to discuss some of the main focal points of any effective cyber risk management strategy. Keep these factors in mind and use them as a directional beacon to guide your enterprise as it develops a well-rounded yet powerful approach. Doing so leverages the many benefits technology provides, all while protecting stakeholders from the shadowy side of the risk spectrum. The modern business environment is littered with examples of once strong, seemingly invincible brands being brought to their knees by an eviscerated reputation. Decades of carefully cultivated trust and goodwill can disappear in just a handful of days by a lackluster cybersecurity approach that exposes all integral parties – employees, customers, investors, vendors, partners, and many others – to a devastating security breach. As technologies and initiatives like the Internet of Things (IoT) and Bring-Your-Own-Device (BYOD) continually gain traction because of their far-reaching insights and convenience, brand reputations are more susceptible than ever to the contemptuous stare of the black hats of the world. In the case of IoT, network-connected objects armed with sensors to collect and communicate data over that network introduce new entry points for intruders to wage their digital war on systems and data. BYOD is another susceptibility, where employees use their own devices for work, thereby accessing sensitive systems from there personal smartphones and tablets. These devices are not issued by the enterprise, so security protocols are no longer a given and must be actively maintained and monitored across those many personal devices. Since digital technologies and trends like IoT and BYOD will only continue to evolve and spread, particularly in the CRE sector where firms can still be considered early adopters, fostering brand integrity must be a primary focus that a comprehensive cyber risk management strategy maintains a perpetual focus on. Protecting personally identifiable information works in conjunction with maintaining a sound reputation. Brand loyalty is a critical component to consistent revenue streams that provide a CRE firm sustenance in good markets and bad. As any experienced CRE enterprise will readily attest, trust is an indispensable asset in developing, maintaining, and growing that ever-important brand loyalty. Without an enduring sense of trust between tenants, partners, and a CRE firm, all parties are suddenly susceptible to the rapidly changing tides felt in commercial real estate. Of course, regulators now enforce formidable security measures in protecting PII through the General Data Protection Regulation (GDPR) and other sweeping regulations. With GDPR, the EU is establishing a new, far more stringent standard for companies that collect consumer data in an effort to protect individual rights and PII, facing substantial fines for non-compliance. However, once again harkening to the need for a firm to be proactive in its security measures, companies must continually look forward to remain a step ahead of any possible security gaps that can expose PII to the dangers of the digital world. Not only will this protect a brand's reputation but, just as importantly, feed into that critical sense of trust that is indispensable for ongoing success in a crowded marketplace. In other words, do everything within reason to protect PII, and tenants will respond accordingly. As CRE firms immerse themselves into the digital frontier, both example and edict should perpetuate cyber risk management. Leadership blazes the cybersecurity trail by continually pushing education that will always serve as the first line of defense against cyber risk. Security threats will never stop evolving, so neither should a firm’s training programs to protect itself from a breach. Governance plays another pivotal role in establishing sound cybersecurity. Constant oversight driven by proactive, comprehensive policies and procedures will continually push and enforce cybersecurity measures. When developing those policies and procedures, prioritize your goals and expectation relative to cyber risk and assign clear responsibilities to individuals, teams, and departments to carry out those functions. Of course, internal audit is the glue that can bind it all together, testing the effectiveness of your cyber risk management and ensuring it evolves with the times. 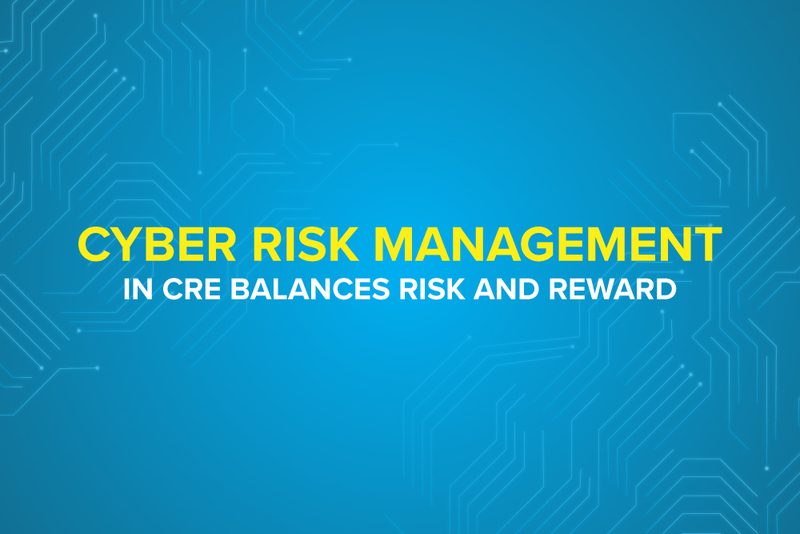 A highly communicative, coordinated approach that is carefully constructed by management and specialists, tested by IA, and sufficiently funded act as the collective cornerstone for any CRE firm’s cyber risk management strategy. Depending on the experience and expertise within your firm, Embark can be an invaluable partner in helping you assemble a digital strategy that effectively straddles that line between innovation and security. Not only are we intimately familiar with the particular demands of the commercial real estate market, we also understand the need for customized solutions that cater to every firm’s individual strengths, weaknesses, expectations, and market position. Between the scope and direction of the strategy itself, preferred vendors, or most other components needed to develop a sound and agile approach to finance and cyber risk, Embark can help you find that critical balance between growth and risk. Simply put, with our Digital Transformation team standing next to you, your stakeholders, employees, and tenants will all feel confident and safe as your finance technology solutions propel you into a successful and secure future. Yes, it is possible, but only with specialized knowledge leading the way.